Year 68 BC was a year of the pre-Julian Roman calendar. At the time it was known as the Year of the Consulship of Metellus/Vatia and Rex (or, less frequently, year 686 Ab urbe condita ). The denomination 68 BC for this year has been used since the early medieval period, when the Anno Domini calendar era became the prevalent method in Europe for naming years. Ab urbe condita, or Anno urbis conditæ, often abbreviated as AUC in either case, is a convention that was used in antiquity and by classical historians to refer to a given year in Ancient Rome. Ab urbe condita literally means "from the founding of the City," while anno urbis conditæ means "in the year since the City's founding." Therefore, the traditional year of the foundation of Rome, 753 BC, would be written AUC 1, while AD 1 would be AUC 754. The foundation of the Empire in 27 BC would be AUC 727. Consuls: Lucius Caecilius Metellus and Quintus Marcius Rex. October 6 – Lucius Lucullus defeats Tigranes II of Armenia in the Battle of Artaxata. Gaius Antonius Hybrida elected praetor. Ostia, the harbour city of Ancient Rome, is sacked by pirates. The port is set on fire and the consular war fleet is destroyed. Consul was the title of one of the chief magistrates of the Roman Republic, and subsequently a somewhat significant title under the Roman Empire. The title was used in other European city states through antiquity and the Middle Ages, then revived in modern states, notably in the First French Republic. The relating adjective is consular, from the consularis. Lucius Caecilius Metellus was a Roman aristocrat. He was praetor in 71 BC. He succeeded Gaius Verres as governor of Sicily in 70 BC. He died in office as consul in 68 BC. His co-consul was Quintus Marcius Rex. Abgar II becomes ruler of Osroene. Arsinoë IV was the fourth of six children and the youngest daughter of Ptolemy XII Auletes. Queen and co-ruler of Ptolemaic Egypt with her brother Ptolemy XIII from 48 BC – 47 BC, she was one of the last members of the Ptolemaic dynasty of ancient Egypt. Arsinoë IV was also the half sister of Cleopatra VII. For her role in conducting the Siege of Alexandria against her sister Cleopatra, Arsinoe was taken as a prisoner of war to Rome by the Roman triumvir Julius Caesar following the defeat of Ptolemy XIII in the Battle of the Nile. Arsinoe was then exiled to the Temple of Artemis at Ephesus in Roman Anatolia, but she was executed there by orders of triumvir Mark Antony in 41 BC at the behest of his lover Cleopatra. Ptolemy Neos Dionysos Theos Philopator Theos Philadelphos was a pharaoh of the Ptolemaic dynasty of Ancient Egypt. He was commonly known as Auletes, referring to the king's love of playing the flute in Dionysian festivals. Cleopatra V Tryphaena of Egypt was a Ptolemaic Queen of Egypt. She is the only surely attested wife of Ptolemy XII. Her only known child is Berenice IV, but she was also probably the mother of Cleopatra VII. Antiochus of Ascalon was an Academic philosopher. He was a pupil of Philo of Larissa at the Academy, but he diverged from the Academic skepticism of Philo and his predecessors. He was a teacher of Cicero, and the first of a new breed of eclectics among the Platonists; he endeavoured to bring the doctrines of the Stoics and the Peripatetics into Platonism, and stated, in opposition to Philo, that the mind could distinguish true from false. In doing so, he claimed to be reviving the doctrines of the Old Academy. With him began the phase of philosophy known as Middle Platonism. Year 130 BC was a year of the pre-Julian Roman calendar. At the time it was known as the Year of the Consulship of Lentulus/Pulcher and Perperna and the Fifth Year of Yuanguang. The denomination 130 BC for this year has been used since the early medieval period, when the Anno Domini calendar era became the prevalent method in Europe for naming years. 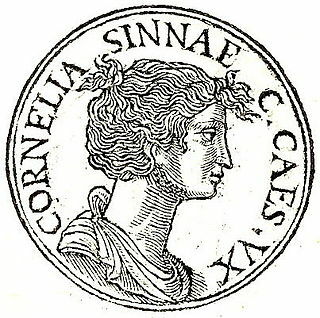 Cornelia was the first wife of Caesar, and the mother of his only daughter, Julia. A daughter of Lucius Cornelius Cinna, Cornelia was related by birth or marriage to many of the most influential figures of the late Republic. Year 100 BC was a year of the pre-Julian Roman calendar. At the time it was known as the Year of the Consulship of Marius and Flaccus. The denomination 100 BC for this year has been used since the early medieval period, when the Anno Domini calendar era became the prevalent method in Europe for naming years. This article concerns the period 69 BC – 60 BC. Year 46 BC was the last year of the pre-Julian Roman calendar. At the time, it was known as the Year of the Consulship of Caesar and Lepidus. The denomination 46 BC for this year has been used since the early medieval period, when the Anno Domini calendar era became the prevalent method in Europe for naming years. This year marks the change from the pre-Julian Roman calendar to the Julian calendar. The Romans had to periodically add a leap month every few years to keep the calendar year in sync with the solar year but had missed a few with the chaos of the civil wars of the late republic. Julius Caesar added two extra leap months to recalibrate the calendar in preparation for his calendar reform, which went into effect in 45 BC. This year therefore had 445 days, and was nicknamed annus confusionis. Year 69 BC was a year of the pre-Julian Roman calendar. At the time it was known as the Year of the Consulship of Hortalus and Metellus. The denomination 69 BC for this year has been used since the early medieval period, when the Anno Domini calendar era became the prevalent method in Europe for naming years. Year 91 BC was a year of the pre-Julian Roman calendar. At the time it was known as the Year of the Consulship of Philippus and Caesar. The denomination 91 BC for this year has been used since the early medieval period, when the Anno Domini calendar era became the prevalent method in Europe for naming years. Year 80 BC was a year of the pre-Julian Roman calendar. At the time it was known as the Year of the Consulship of Sulla and Metellus. The denomination 80 BC for this year has been used since the early medieval period, when the Anno Domini calendar era became the prevalent method in Europe for naming years. Year 108 BC was a year of the pre-Julian Roman calendar. At the time it was known as the Year of the Consulship of Galba and Hortensius/Scaurus. The denomination 108 BC for this year has been used since the early medieval period, when the Anno Domini calendar era became the prevalent method in Europe for naming years. Year 118 BC was a year of the pre-Julian Roman calendar. At the time it was known as the Year of the Consulship of Cato and Rex and the Fifth Year of Yuanshou. The denomination 118 BC for this year has been used since the early medieval period, when the Anno Domini calendar era became the prevalent method in Europe for naming years. Year 284 BC was a year of the pre-Julian Roman calendar. At the time it was known as the Year of the Consulship of Tucca and Denter/Dentatus. The denomination 284 BC for this year has been used since the early medieval period, when the Anno Domini calendar era became the prevalent method in Europe for naming years. The Caecilii Metelli, one of the most important and wealthy families in the Roman Republic, came of noble stock. The Caecilii Metelli remained a political power within the state from the 3rd century BC to the end of the Republic in the 1st century BC, holding every office in the cursus honorum as well as several important military commands. Appius Claudius Pulcher was a Roman politician of the 1st century BC. There is uncertainty about who his father was. It was most probably the Appius Claudius Pulcher who was consul in 143 BC. He was a supporter of Lucius Cornelius Sulla and served as praetor in 88 BC. He was exiled in that year by Gaius Marius while Sulla was away in the east. He returned to Rome after Lucius Cornelius Cinna died in 84 BC, and served as consul in 79 BC and as governor of Roman Macedonia from 78 BC to 76 BC. Quintus Caecilius Metellus Pius was a pro-Sullan politician and general who was Roman consul in 80 BC. He was the principal Senatorial commander during the Sertorian War, fighting alongside Pompeius Magnus. He was given the agnomen (nickname) “Pius” because of his constant and unbending attempts to have his father officially recalled from exile. Quintus Marcius Rex was a consul of the Roman Republic. Lucius Caecilius Metellus Denter was consul in 284 BC, and praetor the year after. In this capacity he fell in the war against the Senones, and was succeeded by Manius Curius Dentatus. Lucius Caecilius Metellus Dalmaticus was a son of Lucius Caecilius Metellus Calvus. He was a Consul in 119 BC, a Censor in 115 BC and then Pontifex Maximus. He had eliminated from the Senate 32 of its members and fought Saturninus, thus contributing to the return to Rome, in 99 BC, of his brother Quintus Caecilius Metellus Numidicus. As Consul he defeated the Dalmatians, having for that deserved his cognomen and the Honours of the Triumph. Gaius Caecilius Metellus Caprarius was a consul of the Roman Republic in 113 BC with Gnaeus Papirius Carbo. He served under Scipio Aemilianus in Numantia around 133 BC. He was praetor in 117 BC. His proconsulship in Thrace in 112–111 BC earned him a triumph. He was censor in 102 BC with his cousin, Quintus Caecilius Metellus Numidicus. Quintus Caecilius Metellus Creticus was a politically active member of the Roman upper class. He was praetor in 74 BC and pontifex from 73 BC until his death. He was consul in 69 BC along with Quintus Hortensius Hortalus. The gens Caecilia was a plebeian family at Rome. Members of this gens are mentioned in history as early as the fifth century BC, but the first of the Caecilii who obtained the consulship was Lucius Caecilius Metellus Denter, in 284 BC.